Welcome to our monthly NOVA DSA organizing and planning meeting. Please take a minute to read our short, brief, not very long, sort-of-illustrated NOVA DSA Socialist Meeting Participation Guidelines (https://docs.google.com/document/d/1V2-YNCRW-Ya2tFzapwLMPMbqWAJZNw4qE40cIWqZti8/edit?usp=sharing). 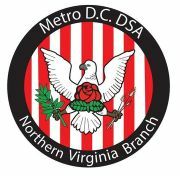 We will be welcoming new members and continue discussing planning for our current actions and campaigns including support for DSA candidates in Virginia Elections, anti-Amazon-HQ2 actions, a future Brake Light Campaign as well as expanded efforts to connect with local groups. As always, we will address any current issues from our communities and allied organizations, including efforts against the alt-right.